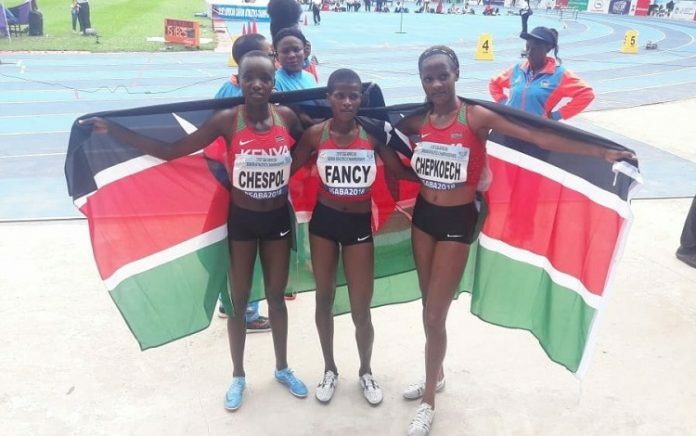 World tecord holder Beatrice Chepkoech led the trio of herself, Celliphine Chespol and Fancy Cherotich in affirming Kenya's long term dominance in the 3000m steeplechase when they staged a clean sweep in the 21st Africa Athletics Championships at Stephen Keshi Stadium in Asaba, Nigeria on Sunday Afternoon. The final stretch of the 21st edition went into the final afternoon and team kenya featured in a number of those events having seen Julius Yego win the men's javelin and Edward Zakayo the 5000m earlier on. Of the teams that featured were the 3000m women steplechase. The three ladies showed intent right from the beginning and record-holder Chepkoech struck the gold in an unofficial time of 8:59.85. Chespol came in second and Cherotich sealed the sweep.